The environment of deltas such as the Mekong and Red River delta in Vietnam is changing. In response, the lives of its inhabitants, such as the rice and shrimp farmers and their families, are also changing. The DeltAdapt project is a large scale research project that analyzes these changes from environmental and social perspectives to find ways in which farmers can maintain their lives and livelihoods in the face of environmental change. More than 40 per cent of the world’s population lives within a 100 km of a coastline. Coastal agricultural land and ecosystems account for some of the world’s major food production areas, providing livelihoods for coastal communities and contributing significantly to countries’ food supply. The high population density in coastal areas, however, places pressure on land and water resources, which weakens the ecosystems that people depend upon. At the same time environmental changes, such as those related to sea level rise threaten existing ways of farming and living. “We completely depend on the weather and environment. This year salt water intrusion into our field cost us 70 per cent of our rice crops, it is the worst harvest we have had in 10 years. We have no savings, so the only thing we can do when we have a financial problem is to ask our family members living in the cities for help. Last year three of our children had to go to the hospital and we had to seek food from charities to feed our family,” says Tran Thi Sa Kien, a female farmer in Tra Bet village, Vietnam. The Mekong and Red River Deltas in Vietnam are highly fertile regions that offer ideal conditions for growing rice, vegetables and fruits as well as aquaculture farming such as shrimp and fish production. Both regions play a crucial role in the economic development of Vietnam. Currently, 63 per cent of the Mekong Delta and 38 per cent of the Red River Delta are used for agricultural production. Rice farming is one of the main agricultural activity in both deltas, it generates household income and contributes to Vietnam’s rice export. However, environmental change is increasingly threatening rice farming. “Climate change is affecting the rice season and these changes are very noticeable in Vietnam’s Delta provinces. Salinity intrusion is affecting rice farming and farmers need support to adapt to these changes,” says Prof. Guong from Can Tho University, Vietnam. Rice crops are fresh water crops and can only tolerate a limited amount of salinity before the yields drop or the crops die off and the harvest is lost. 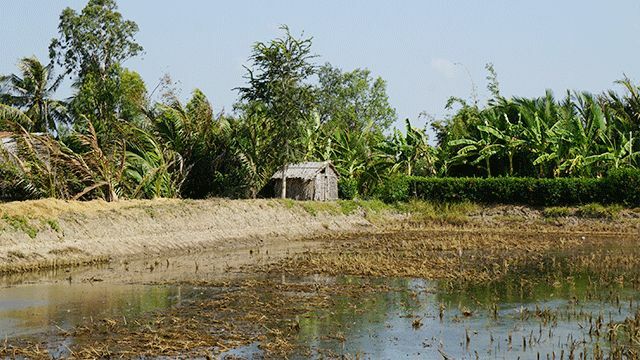 Rising sea levels and a reduction in low flows from the Mekong distributaries causes salt water coming from the East Sea and the Gulf of Thailand to push dozens of kilometers inland, into the many freshwater streams and arms that form part of the Mekong Delta region, damaging farm land. In 2015 a strong El Nino event lead to extremely low amounts of rainfall in the Mekong catchment during the rainy season and consequently to very low river discharges. This, in turn, facilitated an early and heavy salt water intrusion into the delta during the dry season 2015/2016 with all its negative consequences on freshwater availability and agriculture. “For the last years we could live well, but this year the saline water came into the field and destroyed the rice. The drought lasted longer and started earlier. We have less this year, not enough, and now the young people will go to Saigon to find work” Said farmer Tran Thi Sa Kien from Tra Bet village, Vietnam. 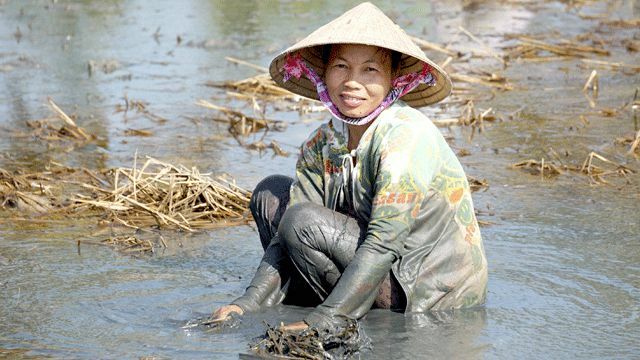 In 2000, the government of Vietnam encouraged farmers in certain districts where salt water intrusion was already high to change from rice to shrimp farming. The decision was also linked to rising shrimp prices on the global markets. The return on investment for shrimp is generally much higher than for rice, but shrimp farming also requires a larger financial investment by farmers as they have to prepare the ponds, buy juveniles, food and it bears a higher risk of crop failure due to diseases. In other villages, a dual system was introduced where farmers would alternate between farming rice and shrimp. This can be done in the same basins if the soil is prepared correctly. Villages further away from the coast are still farming rice as well as vegetables, fruits and engage in freshwater aquaculture, but they too are feeling the impacts of increasingly saline ground water. The DeltAdapt research project explores how farmers in the Mekong and Red River deltas are currently adapting to the increasing intrusion of salt water and to the salinization of their water and soil resources and assesses how sustainable the coastal agricultural systems and ecosystems are now and in the future. The project specifically focuses on how the ecosystem and rural livelihoods change when farmers decide to move from just farming rice to farming rice in one season and shrimp in another or convert entirely to shrimp production. These adaptation processes have immense consequences for soil quality, biodiversity of wild fish, climate and community livelihoods. Based on the research findings the project will develop concrete policy recommendations, including technology transfer, to local, regional and national decision makers that will support farmers in the Mekong and Red River delta regions in their efforts to adapt to salinity intrusion. The environment of the Deltas is changing and farmers will need to adapt to those changes to maintain their lives and livelihoods. “At the end of the DeltAdapt project, we want to link all the different results. We are hoping for a complete picture for the farmers in the Mekong Delta, so that we can provide solid recommendations. The farmers trust us and with this trust comes a big responsibility, so we are taking our work very serious,” says Prof. Nguyen Duy Can of Can Tho University, Vietnam. The DeltAdapt project is a collaboration between leading global experts from German and Vietnamese scientific institutions. The team is made up of PhD students, senior academics and private sector experts. All share the common goal to develop solid research findings that will form the basis for policy recommendations to help farmers adapt to the changing environment. Many of the partners share a long history of joint research interests and a strong appreciation for each other’s scientific expertise. On the German side, the project partners are: UNU-EHS, University of Bonn, Forschungszentrum Jülich, University of Würzburg, Helmholtz-Zentrum für Umweltforschung (UFZ), and TerrAquat Consultants. On the Vietnamese side, the partners include multiple departments from both, Can Tho University (CTU) and Vietnam National University of Agriculture (VNUA) Hanoi University. The project is funded by the German Federal Ministry of Education and Research (BMBF) and is expected to deliver its final project findings in 2017.